Mathieu Jacquet, part of a French family of sculptors. They probably came from Grenoble and were active in Paris and the surrounding region from the 16th century to the end of the 17th. Antoine Jacquet, also known as Antoine de Grenoble (c. 1500-c. 1572), was a sculptor, mason and architect. He worked at the chteau of Fontainebleau from 1538, executing stucco decoration, providing architectural models and casting bronze. 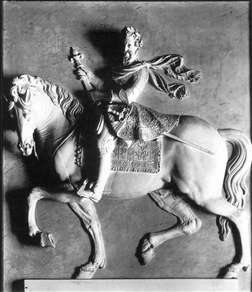 Among his other works was ornamental sculpture executed under the direction of Francesco Primaticcio for the tomb of Henry II in Saint-Denis Abbey. His son Mathieu Jacquet, a contemporary of Germain Pilon, was the most eminent member of the family. Mathieu Jacquet was trained in the stylistic tradition of the Fontainebleau School, coming also under the influence of Germain Pilon. He moved to Paris around 1570, and his early work continued in the decorative Mannerist tradition of his father and the other artists and craftsmen who had worked on the decoration of the chteau of Fontainebleau. From 1583 he worked frequently for the powerful Neufville de Villeroy family on funerary monuments and on their various houses. His career in royal service began in 1590, when he was put in charge of the abandoned works for the Valois Chapel at Saint-Denis Abbey, but was disrupted by the political disturbances of the early years of Henry IV s reign. Jacquet held the title of Sculpteur Ordinaire du Roi from 1595 and was Garde des Antiques du Roi from 1608 to 1610. His most famous work is the Belle chemine at the chteau of Fontainebleau. See more details about "Henry IV"